^ 1.0 1.1 Hoyle, F. The synthesis of the elements from hydrogen. Monthly Notices of the Royal Astronomical Society. 1946, 106 (5): 343–383. Bibcode:1946MNRAS.106..343H. doi:10.1093/mnras/106.5.343. ^ 2.0 2.1 Hoyle, F. On Nuclear Reactions Occurring in Very Hot STARS. I. The Synthesis of Elements from Carbon to Nickel. The Astrophysical Journal Supplement Series. 1954, 1: 121. Bibcode:1954ApJS....1..121H. doi:10.1086/190005. ^ 3.0 3.1 Burbidge, E. M.; Burbidge, G. R.; Fowler, W.A. ; Hoyle, F. Synthesis of the Elements in Stars (PDF). Reviews of Modern Physics. 1957, 29 (4): 547–650. Bibcode:1957RvMP...29..547B. doi:10.1103/RevModPhys.29.547. ^ Suess, H. E.; Urey, H. C. Abundances of the Elements. Reviews of Modern Physics. 1956, 28 (1): 53–74. Bibcode:1956RvMP...28...53S. doi:10.1103/RevModPhys.28.53. ^ 5.0 5.1 Clayton, D. D. Principles of Stellar Evolution and Nucleosynthesis. University of Chicago Press. 1968. 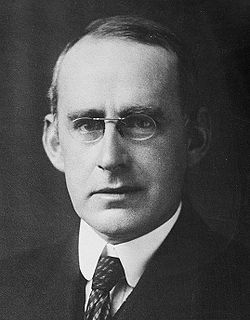 ^ Eddington, A. S. The internal constitution of the stars. The Observatory. 1920, 43: 341–358. Bibcode:1920Obs....43..341E. ^ Eddington, A. S. The Internal Constitution of the Stars. Nature. 1920, 106 (2653): 14. Bibcode:1920Natur.106...14E. doi:10.1038/106014a0. ^ Selle, D. Why the Stars Shine (PDF). Guidestar. Houston Astronomical Society: 6–8. October 2012. （原始内容存档 (PDF)于2013-12-03）. ^ Bethe, H. A. Energy Production in Stars. Physical Review. 1939, 55 (5): 434–456. doi:10.1103/PhysRev.55.434. ^ Lang, K. R. The Life and Death of Stars. Cambridge University Press. 2013: 167. ISBN 978-1-107-01638-5. ^ Clayton, D. D. HISTORY OF SCIENCE: Hoyle's Equation. Science. 2007, 318 (5858): 1876–1877. doi:10.1126/science.1151167. ^ Cameron, A. G. W. Stellar Evolution, Nuclear Astrophysics, and Nucleogenesis (PDF). Atomic Energy of Canada. 1957. Report CRL-41. ^ Clayton, D. D.; Fowler, W. A.; Hull, T. E.; Zimmerman, B. 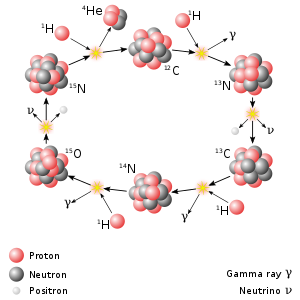 A. Neutron capture chains in heavy element synthesis. Annals of Physics. 1961, 12 (3): 331–408. doi:10.1016/0003-4916(61)90067-7. ^ Seeger, P. A.; Fowler, W. A.; Clayton, D. D. Nucleosynthesis of Heavy Elements by Neutron Capture. The Astrophysical Journal Supplement Series. 1965, 11: 121–126. Bibcode:1965ApJS...11..121S. doi:10.1086/190111. ^ Bodansky, D.; Clayton, D. D.; Fowler, W. A. Nucleosynthesis During Silicon Burning. Physical Review Letters. 1968, 20 (4): 161–164. Bibcode:1968PhRvL..20..161B. doi:10.1103/PhysRevLett.20.161. ^ Bodansky, D.; Clayton, D. D.; Fowler, W. A. Nuclear Quasi-Equilibrium during Silicon Burning. The Astrophysical Journal Supplement Series. 1968, 16: 299. Bibcode:1968ApJS...16..299B. doi:10.1086/190176. ^ Clayton, D. D. Cosmoradiogenic Chronologies of Nucleosynthesis. The Astrophysical Journal. 1964, 139: 637. doi:10.1086/147791. ^ Adelberger, E. G., Austin, S. M., Bahcall, J. N., Balantekin, A. B., Bogaert, G., Brown, L. S., ... & Duba, C. A. (1998). Solar fusion cross sections. Reviews of Modern Physics, 70(4), 1265. ^ Adelberger, E. G., García, A., Robertson, R. H., Snover, K. A., Balantekin, A. B., Heeger, K., ... & Chen, J. W. (2011). Solar fusion cross sections. II. The p p chain and CNO cycles. Reviews of Modern Physics, 83(1), 195. Bethe, H. A. Energy Production in Stars. Physical Review. 1939, 55 (1): 103. Bibcode:1939PhRv...55..103B. doi:10.1103/PhysRev.55.103. Bethe, H. A. Energy Production in Stars. Physical Review. 1939, 55 (5): 434–456. Bibcode:1939PhRv...55..434B. doi:10.1103/PhysRev.55.434. Hoyle, F. On Nuclear Reactions occurring in very hot stars: Synthesis of elements from carbon to nickel. Astrophysical Journal Supplement. 1954, 1: 121–146. Bibcode:1954ApJS....1..121H. doi:10.1086/190005. Clayton, Donald D. Principles of Stellar Evolution and Nucleosynthesis. New York: McGraw-Hill. 1968. Ray, A. Stars as thermonuclear reactors: Their fuels and ashes. 2004. arXiv:astro-ph/0405568 [astro-ph]. G. Wallerstein; I. Iben Jr.; P. Parker; A.M. Boesgaard; G.M. 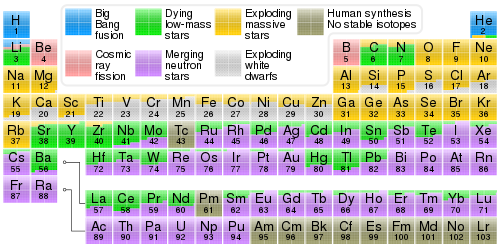 Hale; A. E. Champagne; 等. Synthesis of the elements in stars: forty years of progress (PDF). Reviews of Modern Physics. 1997, 69 (4): 995–1084 [2006-08-04]. Bibcode:1997RvMP...69..995W. doi:10.1103/RevModPhys.69.995. （原始内容 (PDF)存档于2009-03-26）. Woosley, S. E.; A. Heger; T. A. Weaver. The evolution and explosion of massive stars. Reviews of Modern Physics. 2002, 74 (4): 1015–1071. Bibcode:2002RvMP...74.1015W. doi:10.1103/RevModPhys.74.1015. Clayton, Donald D. Handbook of Isotopes in the Cosmos. Cambridge: Cambridge University Press. 2003. ISBN 0-521-82381-1.